Heating (unusual accommodation in April and May): €15 – Free in February, March, October, and November. 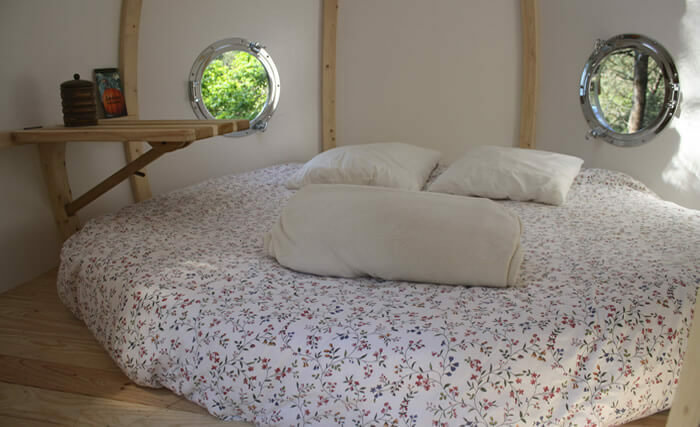 Sleeps 1-2 – Double bed. Large round mattress, 2.15m diameter. Double bed. Large round mattress, 2.15m diameter. Bedding, candles, and dynamo lamp provided. Towels not provided. Secure balcony half-way up. Breakfast hamper included. No running water or electricity. Dry toilets nearby, not far from ground (traditional toilets can be found in the main farm 300m away). Unheated. Gourmet dinner hamper for a romantic meal in your room or on the balcony, or eat at the rural restaurant, the Table de DIHAN. 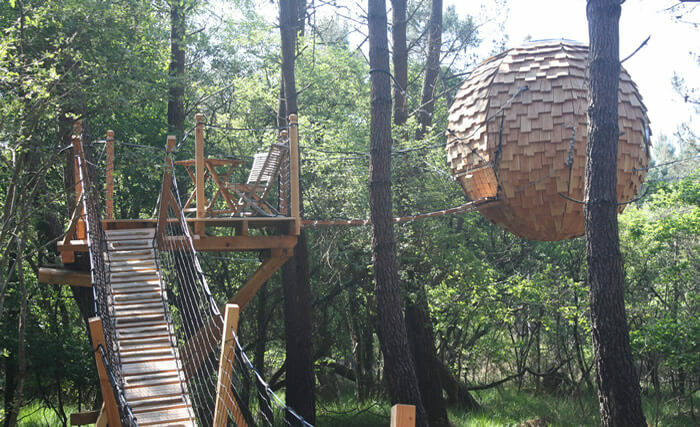 The Lov’nid is suspended 5m from the ground, accessible by a secured wooden rope bridge, in woods 300m from car park. 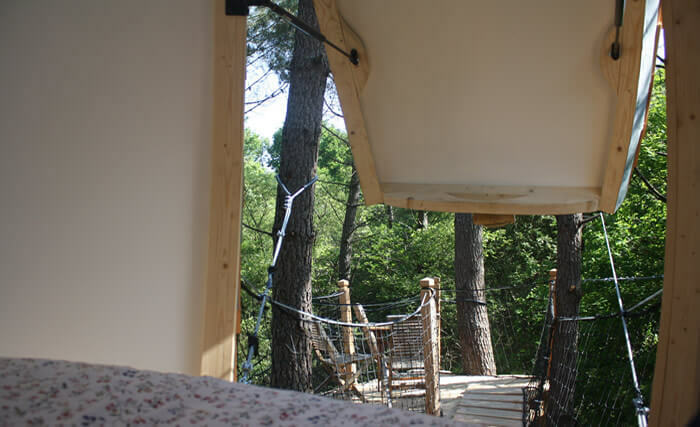 Exclusive Treehouse in Brittany and western France. Unique guest house Lov’nid Treehouse. 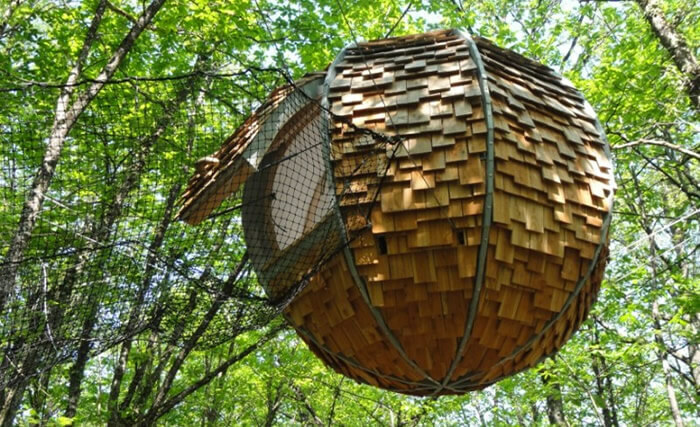 The lov’nid (love nest) is worthy of its name: it is a hanging cocoon for a unique night among the treetops, an unusual holiday or romantic weekend. 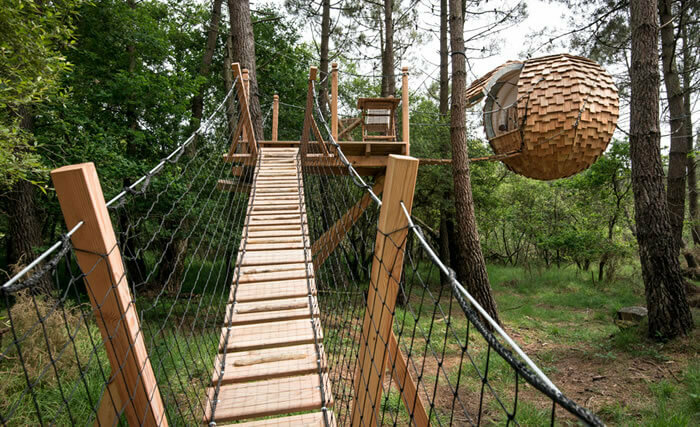 An atypical place to stay, UNIQUE in Brittany and all of western France, it forms a harmonious part of the Dihan woodland, and you may well wonder to which fantastic tree this otherworldly seed comes from…. A guest house gently traced in wood. 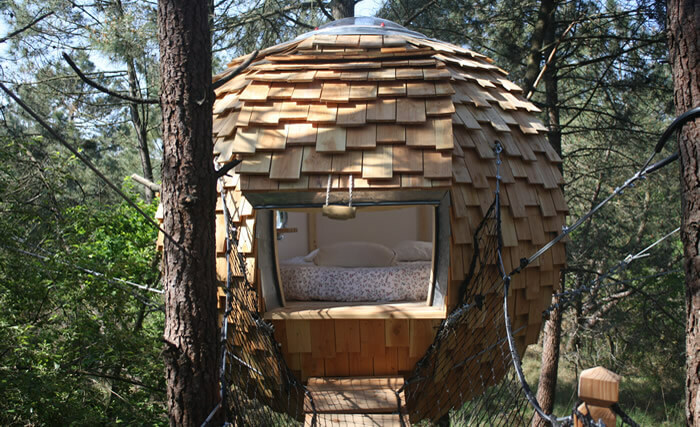 Imagine your round nest is a soft bed awaiting you, a porthole open to the stars, a factory of dreams… Of all of our unique places to stay, this one is a real treat! Enjoy breakfast on the balcony halfway up.